On November 17-18, the Armenian parliament will be convened for a special session to discuss the treaty on Armenia’s accession to the Eurasian Economic Union (EEU). Although officially out of six parliamentary factions only two have expressed their positions on the matter, there is little doubt that the Parliament will ratify the document. The ruling Republican Party of Armenia (RPA) that has a majority in the legislature is for the treaty. Only two parties making up one faction – Heritage and Free Democrats – have pronounced against the move. But the faction makes only 5 percent of the total number of deputies. A few other individual MPs may also vote “against”, for example, Nikok Pashinyan who formally represents the Armenian National Congress (ANC) faction. A remarkable consensus on the issue of joining the EEU has been formed in Armenia. Moreover, while the ruling RPA is trying to talk also about the economic benefits of joining the 170-million-strong market, the opposition ANC, rather, talks about the danger of “Ukrainianization” in case Armenia fails to join the Russian-led bloc. Thus, it acknowledges that the step is taken under coercion. Addressing opposition supporters at a rally in Yerevan on Friday ANC leader, first president Levon Ter-Petrosyan reiterated his opinion that Armenia’s membership in the EEU is an irreversible process and is now also a “fait accompli”. He never said that the entry is profitable. Instead, he accused those who oppose it of “adventurism”. The ex-president cited the example of the events in Ukraine, which has lost a lot due to its failure to agree to join the “New USSR”, and the same could also happen to Armenia. “Is it really so hard to understand that in such a situation our country would simply disappear from the world map? ... Even the West treats Armenia’s decision with understanding, while a group of people here are trying to prove the opposite and push for an anti-Russian movement,” said Ter-Petrosyan. 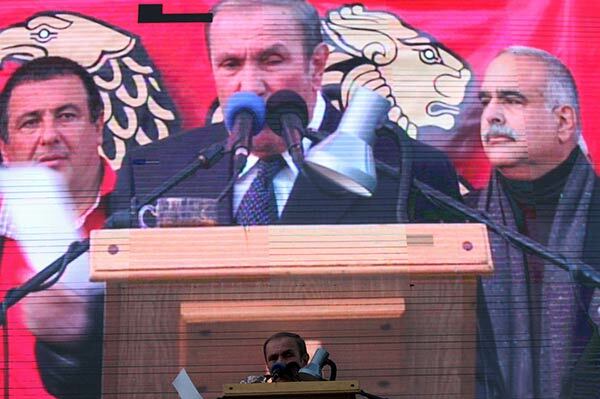 Heritage Party leader Raffi Hovannisian, who also addressed the rally, disagreed with Ter-Pertrosyan. Hovannisian thinks that Armenia is losing its sovereignty by joining the pro-Russian alliance. The leader of the third party that participated in the rally, Gagik Tsarukyan, of Prosperous Armenia, did not address the EEU issue in his speech. This allowed Russian Ambassador to Armenia Ivan Volynkin to conclude that almost all opposition forces in the country support its membership in the EEU. Some experts and political analysts argue that after the formal accession of Armenia to the EEU Yerevan will see requests that will further restrict its sovereignty. For example, at the October 10 meeting in Minsk, Belarus, where President Serzh Sargsyan signed the treaty, Russian President Vladimir Putin presented the first demand – to come up with a “joint position” on Ukraine. And although the two other members of the EEU – Kazakhstan and Belarus – have their own positions on Ukraine, it is also known that earlier Armenia, at the UN General Assembly voted against the resolution condemning the annexation of Crimea by Russia. As some experts say, Armenia is turning into Russia’s “second vote” at international structures. Besides, there is a danger to the Armenian language – Russian is the official language in the EEU and it is a second state language in Belarus and Kazakhstan. Russian politicians have repeatedly hinted at the need for Armenia to declare Russian as a second state language. “In the Customs Union of Russia, Belarus and Kazakhstan we use Russian as a working language, while in Armenia, as is known, the Armenian language is used,” he said.